Today, I received another fun email from my son’s school. The complaint is that he is picking his skin. The teacher then follows up with “if he picks again tomorrow and it bleeds, we will have to remove him from class.” Really, I wanted to reply, “DID YOU CALL THE OT (Occupational Therapist) and discuss another solution to picking?” I didn’t say these exact words because I am trying to pick my battles. Instead, I sat down with my husband and reviewed the email. We discussed how we wanted to approach this with Nolan. My husband had a great idea. He suggested that we have Nolan come up with the solution. So, we called Nolan into the office. Nolan’s immediate response is, “Did I do something wrong?” When Nolan says this it always makes me a little sad. When he asked us if he was in trouble, we told him, “No, we need your help with something.” We asked him where his squeeze ball was located. We talked to him calmly about the many reasons why picking his skin is not healthy. He said he needed to do something with his hands, He said he stopped using the squeeze ball because he might start playing with it. Then, we asked him how could we solve this situation. Nolan came up with a brilliant solution. He said he would use the squeeze ball if he could have a something attached to it so that it would not fall out of his hand when he squeezed it. Nolan thought of putting the ball into a mesh bag. He could then slide his hand into the bag and squeeze the ball. He said his biggest concern is that the squeeze ball will fly out of his hand and he will get in trouble. 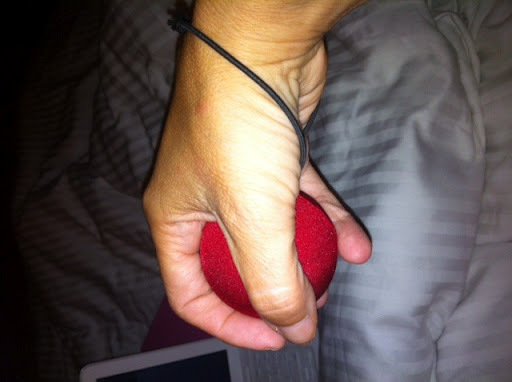 This gave my husband some ideas for revamping the squeeze ball. 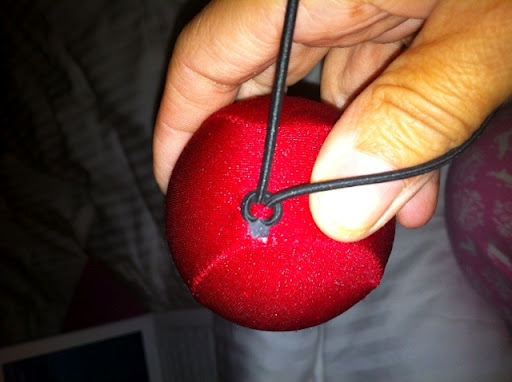 The first attempt was some string tied around the ball. That didn’t work. Every time he squeezed the ball, the string feel off. So, we decided to put the project down and walk the dog. We needed to look at this differently. We had an “AH HA!! !” moment. We realized we could make a small hole at the top part of the nylon covering and insert and string. The string looped into the top part which fits around the wrist. The string is long enough to fit around Nolan’s hand. Now, Nolan can squeeze away. I have no idea if it will work. The most important piece is that Nico had a say in how to stop his picking. In fact without his input the new and improved squeeze ball would not have seen the light of day. The link below is an interview with Jerome Bubrick, PhD, is a nationally renowned cognitive and behavioral psychologist who specializes in the treatment of obsessive-compulsive disorder (OCD). I really enjoyed this interview. This interview talked about OCD and anxiety issues. In addition, Dr. Bubrick discusses what the root of the anxiety. He discusses how these are genetic and through the brain as well as, learned. The most important part about their work is to teach parents, teachers to be proactive and intervening to help the children through the anxiety. Most important tip to remember is never be dismissive about a child’s anxiety. It is not a good decision to say, “It is all in your head.” The recommendation for treatment is CBT (Cognitive Behavioral Therapy). Through this therapy helps teach people how they think, feel and do. CBT is not just therapy where people talk about their anxiety. The person talks about how they think, how it makes them feel and then what the person can do about the feelings. It is a structural approach that moves at the individuals pace. Click on the link below and take some time to listen.